Today’s object of interest was purchased at the local ALDI – Simms Teriyaki Beef Jerky. Taste (B-): This jerky has a decent flavor. Not particularly complex, but still enjoyable. There’s a dominant smoky flavor with a complementary, but somewhat competitive, soy overtone. It grows on you. The seasoning does, overall, work well with the beef and the end result is a snack you’ll like, if not necessarily crave again soon. Texture (B): While a tiny bit too try, this jerky has a reasonably good chew to it and delivers a pleasant experience. The pieces are still moist enough to eat comfortably and you’ll easily enjoy yourself bite to bite. Smell (C+): The smell of this jerky is squarely okay, but nothing remarkable. You can smell the smoke and soy pretty distinctly, and that’s where it sort of falls short. These smells should complement and blend rather than jump out on their own. It’s not at all unpleasant, but it doesn’t really add anything to the overall experience. Appearance (B): The jerky looks pretty good. The color is dark and rich, the meat cut into well-sized snack-sized bites, and is generally appetizing. While not a feast for the eyes, Simms shows their obvious attention to the quality of their project here. Consistency (B): You won’t notice much variation from your first bite to your last, taste-wise, but you’ll notice a pretty big difference in the size and thickness of your pieces. While the majority of pieces in the bag were generally in the inch-or-so size range, there were a lot of what I’d have to call ‘crumb’ pieces. You would expect to have some of these tiny little bits in any bag of jerky of this ilk, but there seemed to be a bit much in this bag. I doubt this would bother most folks, or even register as a point of observation, but in this evaluation it stood out. Overall Impression (C+): If you’re looking for a relatively inexpensive snack jerky you’ll do fine here. 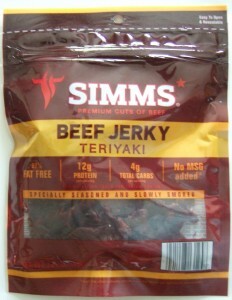 Dollar for value your cash will go far and this is just the sort of jerky to pick up for everyday snacking or as a quick something to munch while on the go.